The Association for Pet Obesity Prevention estimates that 60 percent of cats are either overweight or obese. If you're a cat owner, it's important to know what constitutes a healthy weight for your cat. Cats come in small, medium and large, as well as the teacup or "mini" sizes. Within those groupings certain breeds may be larger or smaller than most. To get an idea of what your cat's weight should be, use the chart to find the column for your cat's size. Keep in mind that female cats will always be a bit smaller than the males. Males are 12 pounds plus. Is My Cat a Healthy Weight? Look at your cat from above so you can see along the length of his body. The cat should be standing up. Run your hands along both sides of the cat's body. You should be able to feel the curves of your cat's ribs, but they should not be sticking out too much and visible otherwise your cat is underweight. If you can't feel any ribs, this means your cat is overweight. You should be able to see your cat's waist and it should be smooth without extra rounds of fat, and not too concave that the waist looks sunken in. Other signs your cat may be an unhealthy weight include lethargy, dull-looking fur and other symptoms such as trouble breathing, allergies and vomiting. It's important to keep your cat at a healthy weight to prevent other medical conditions such as diabetes and kidney disease. There are a couple of steps you can take if your cat is fat. Look at your cat's daily food intake. Read the label on the bag for recommended feeding amounts. An average 10-pound cat should be eating around 200 calories per day. Use a diet cat food if your cat is too heavy. Your vet can prescribe a brand such as Hill's Digestive/Weight Management or Pro Plan Overweight Management Formula. You could also look for a store-bought brand that is low carb with no more than 5 percent. Make sure your cat isn't getting any other type of food, such as treats, human food or garbage can scraps. Start your cat on an exercise regimen. Bring out some cat toys such as a feather wand or a catnip toy that will make him move around. You can even train him to wear a harness and take a walk. Keep track of your cat's weight to see if you're making progress. Since you can pick a cat up, it's easy to weigh them at home by just standing on the scale with your cat, and then putting him down. Subtract your weight alone from the weight holding the cat and you have your cat's weight. Behavior problems such as fear and anxiety can cause a cat to lose weight because something in the environment may be scaring them away from their food bowl. Cats suffering from conditions such as cancer, diabetes, feline infectious peritonitis (FIP), and parasites will show weight loss. 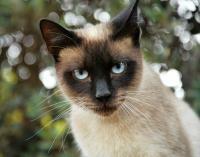 Cat that have parasites may also lose weight. If your cat's teeth are not checked regularly by a veterinarian, he could be avoiding eating because of a dental problem such as a tooth abscess. 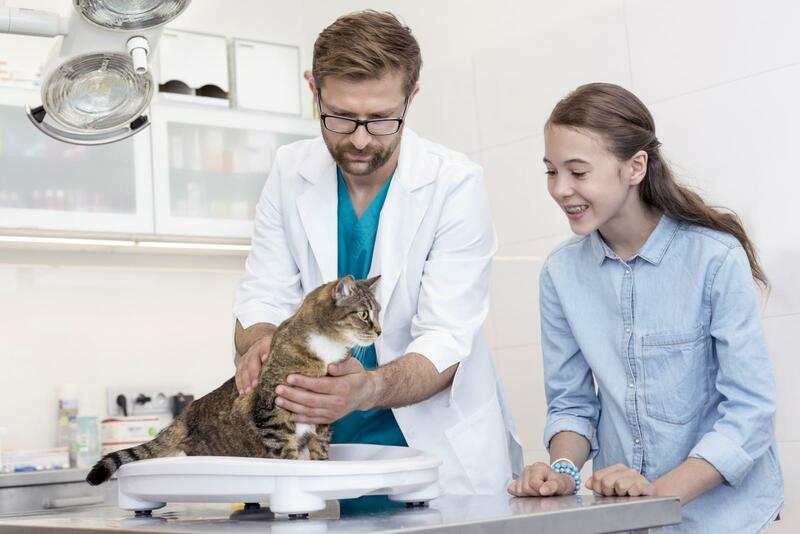 Once you've determined the reason for your cat's weight loss, your veterinarian can work on treating the underlying medical issue and provide you with a healthy diet to help your cat gain weight. Always consult with your veterinarian if you're concerned about your cat's weight to make sure there is nothing else wrong. Too much or too little weight can mean your cat has a medical problem, or is on their way to having one.